I was fully prepared to enjoy this book, having already enjoyed one by J.P. Moreland earlier this summer called Love Your God With All Your Mind. So if he can write such an excellent book on the role of the mind in the life of the Christian, why not on the role of the spiritual disciplines in the life of the Christian? 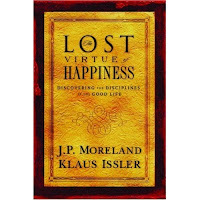 After all, that is how The Lost Virtue of Happiness by Moreland and Issler was billed. "Discovering the disciplines of the good life"
"A fresh look at the spiritual disciplines"
Alas, I was disappointed on two fronts. Unfortunately, the earlier book I'd read by J.P. Moreland was a factor in this book being a let-down. In at least two rather extended portions (that I noticed), J.P. borrowed heavily and even quoted word for word sections from Love Your God With All Your Mind. This is not a grave offense, I've noticed other authors do it before. However, in this instance it felt forced and a little out of place because the sections did not seem to fit the expressed intent of the book. Which brings me to my second critique. For a book supposedly dealing with spiritual disciplines, they were not the disciplines I was expecting. 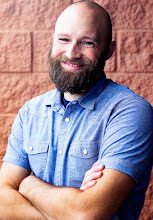 Instead of chapters devoted to prayer, fasting, and the study of the Scriptures, there were chapters like "Embracing the Hiddenness of God" and "Defeating Two Hardships of Life: Anxiety and Depression". After I got over the initial disappointment of being misled by the packaging, I found the book somewhat insightful in finding happiness in the Christian life (I would recommend this book to any Christian dealing with depression). I know that often the publishers have the final say on what is on the front and back cover. Unfortunately, if that was the case with this book, it made some truly engaging and helpful material feel like a "miss" for me.